Most visitors to Cairo spend some time looking at the more recent monuments, notably the great mosques and Islamic buildings clustered in the oldest part of the city. Cairo is unique, in that its Islamic monuments are part of an uninterrupted tradition that spans over a thousand years of building activity. No other Islamic city can equal Cairo’s spectacular heritage, nor trace its historical and architectural development with such clarity for over a thousand years. Early travellers and artists visiting Egypt fell in love with the Islamic monuments, which are only now receiving the attention of the more general visitor. This new edition of a popular and handy guide is an essential reference for any visitor. It lists over two hundred Islamic monuments, not only mosques, but madrasas, mausoleums, sabils and palaces. A glossary explains some of these terms: madrasas are "places of study" and sabils are "public drinking fountains". 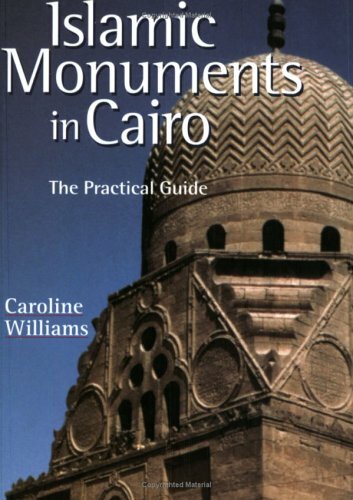 The guide begins with an overview of Cairo’s ruling dynasties, which may appear as daunting to some as the ancient dynasties, so readers are soon able to recognize and understand the architectural differences between the Fatmid, Ayyubid, Mamaluk and Ottoman styles.. The book is then divided into clear sections, with maps, plans and details of all the sites, ideal for visitors to plan a walking tour of the monuments. For each site, the book provides a wealth of detail. If you are visiting the Islamic sites with an organised tour, a tour guide is usually provided, but such tours will probably cover only the popular sites such as the Mohamed Ali Mosque at the Citadel and perhaps the Sultan Hasan Mosque nearby. It is easy to reach all the locations mentioned in the book on foot or by taxi, but at some of the less-visited sites, no guides are available and that is when the book really comes into its own. It will make sure that once you have found a site, you do not miss anything of interest and can put the monument into its historical context. With many illustrations (photographs and line drawings) maps and plans, this easy-to-read book is exactly what it says on the cover – "The Practical Guide". Use it and enjoy visiting some stunning monuments. 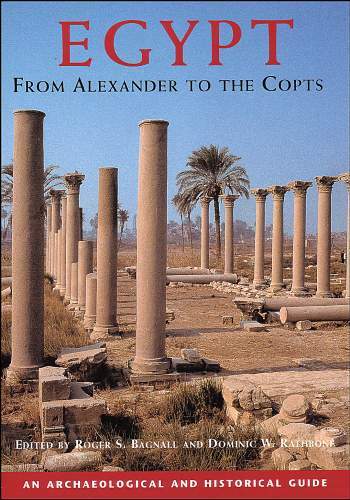 Published by The American University in Cairo Press, revised edition 2004. ISBN 977 424 695 0. Paperback. edited by Roger S. Bagnall and Dominic W. Rathbone. From the title of this book, it would appear that what we have is a history of Egypt, and certainly in the first chapter this is exactly what it is, covering not just the history, but the culture, religion and art of the period following the conquest of Egypt by Alexander the Great in 332 BC to the Arab conquest in 641 AD. This period of Egyptian history is well recorded and much survives to interest the visitor to Egypt, but is often overlooked or badly served in guide books. This is where this new book really comes into its own, for it is much more than a history, serving as an archaeological guide to the surviving monuments from this period. When visiting the pharaonic monuments, guides will often point out later Ptolemaic additions and the occasional Coptic ruin, often as an afterthought; these remains are invariably worthy of closer attention, but are often difficult to understand and interpret. The major Ptolemaic temples are of course well served by guide books and with tour guides on trips, but in the entry for the Temple of Luxor, for example, we learn from this book of the additions to the temple made by Alexander the Great, and cartouches of his brother, Philip III Arrhidaios in the colonnade of Amenhotep III. Ptolemy IV carried out repairs to the court of Rameses II and the Roman emperor Tiberius ordered major repairs following flooding by high levels of the river Nile. A Roman temple of Serapis was constructed outside the temple entrance, and under Diocletian, the temple was at the heart of a major Roman military camp, and surrounded by fortified walls; it was during this period that Christian churches were built in the temple precinct. The book is organised into chapters, each looking at a geographical area, so we move from Alexandria, the Delta and northern Sinai, down through Middle Egypt and as far as the Western Oases and the Eastern Desert. All of the well-known sites are included, plus a number which may be unfamiliar, but which readers of this book might be inspired to try to visit. Many of the sites mentioned in the book no longer exist, such as the great Monastery of Phoibammon at Deir el Bahri, removed completely to clear Hatshepsut’s temple which lay underneath, and a large church at the heart of the temple of Rameses III at Medinet Habu, also cleared to reveal the temple. Archive photographs and the drawings made by early travellers are sometimes the only record of these structures to survive. This book, written by a dozen leading experts, is an absolute must for anyone planning a visit to any of the sites in Egypt, and an ideal on-the-spot companion, but also essential reading, as an armchair guide, for anyone who has already visited the sites. It will make sense of the oftenasked questions "I wonder when that was built?" or "What is that?" 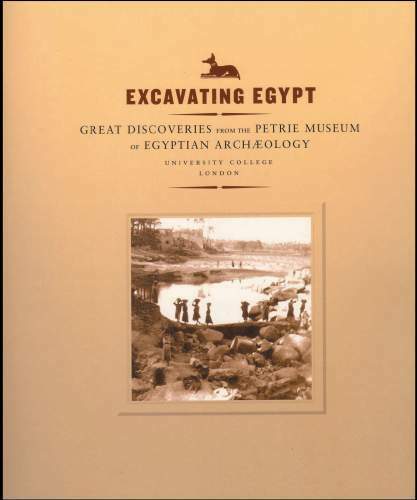 As up-to-date as it is possible to be and including plans, diagrams, drawings and photographs of sites and parts of sites that have rarely been seen before, this is a book definitely to be used and re-used and will add greatly to any visit to the antiquities of the Nile Valley. Published by The British Museum Press, 2004. ISBN 0 7141 1952 0. Readers might, not unreasonably, expect this to be a new book on the subject of Egyptian building technology. This is not the case. It is a re-print of a book probably produced at the end of the nineteenth century or early twentieth, although infuriatingly there is absolutely nothing in the book to confirm this or to say when it was first published or by whom, which I find unforgivable. The book can be dated by the appearance of the type face, the illustrations (only a few and of poor quality) and by the spelling of Egyptian names (Aswan is spelt Assouan). Equally dated is its content, as so much new has been learnt in the last hundred years as to make it obsolete. 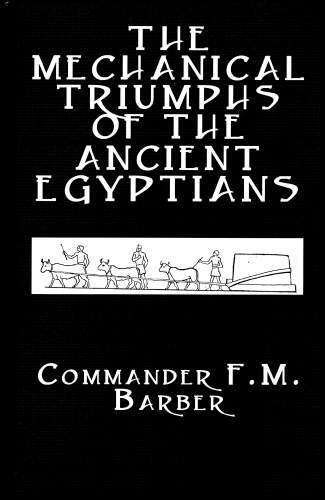 Whilst reprinting some books has some merit (such as some of the early excavation reports) this particular edition has no merit whatsoever and I have, as yet, been unable to find out who Commander F.M. Barber was. This volume is one of a series of old books produced in facsimile form, when they are out of copyright so that no authors expect royalties. At £85 the price is absolutely outrageous, especially for a slim book with only one hundred and twenty-three pages. Watch out for other titles that appear to be new books, but which are not, all at equally mind-numbing prices. Included in the series are books by Arthur Weigall, which are worth reprinting. These have just fallen out of copyright (which is seventy years from the death of the author) but readers who want these titles would be better advised to look for second-hand copies, which will be considerably cheaper. Published by Kegan Paul Limited, 2005. ISBN 0 7103 1004 8. The opening of a new exhibition is often the occasion for the publication of a large-format, fully illustrated and described catalogue. In the past there have been some splendid publications of this genre, and two new exhibitions have produced two equally superb catalogues. The joy of such catalogues it that they often focus on objects that have not been displayed in museums before, or are overshadowed by other objects considered to be more important. Often the items illustrated are not great works of art, but humbler pieces, or domestic day-to-day items, not otherwise seen; that is why such catalogues are so valuable and can be recommended. Buy them whilst the exhibitions are still on, for often they become sought-after reference books in the future. If you are able to visit the exhibitions, they are an ideal souvenir; if you can’t (and the two catalogues reviewed here refer to exhibitions in the United States, so only a few AE readers will be able to attend them) buying a catalogue can be almost as good as actually being there. This is the catalogue of a new exhibition, at the Bowers Museum of Cultural Art in California, of objects from the British Museum – the largest exhibition of mummies and related material to be held outside the walls of the British Museum. The Bowers Museum is the only U.S. venue and the exhibition will be open for at least five years. Many of the objects on loan have been seen and published before and will be familiar to some people, but the opportunity was taken to include many more objects that have not been displayed in London and that have not been fully studied and published before. The selected objects range from a large granite Sekhmet statue to the smallest faience amulets, all superbly illustrated and described in this large-format catalogue. 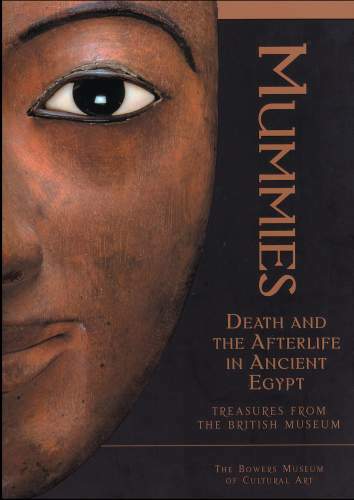 The catalogue is divided into seven chapters: The Gods; Beliefs About the Afterlife; Mummification; Trappings of the Mummy; Cult of the Dead; Furnishings of the Tomb; and Servants for the Afterlife. A full bibliography completes the packed two hundred and forty pages. The photographs are superb and the text is well written. The objects are described in detail, with additional information to put them in their historical and cultural context. The catalogue is a delight to read, and can be enjoyed by both beginner and expert. For more information about the exhibition and the Bowers Museum, visit www.bowers.org. by John H. Taylor and Nigel C. Strudwick. Published by the Bowers Museum of Cultural Art, 2005. ISBN 0 9679612 6 2. Paperback. by Betsy Teasley Trope, Stephen Quirke and Peter Lacovara. Published by Michael C. Carlos Museum, Emory University, 2005. ISBN 1 928917 06 2. Paperback. This is the illustrated catalogue of a substantial loan exhibition from the Petrie Museum to the Michael C. Carlos Museum in Atlanta, Georgia, USA. The exhibition is devoted to the life and accomplishments of W.M. Flinders Petrie, the "father" of Egyptology, whose finds fill museum galleries around the world, and whose own collection is housed in the museum that bears his name in London. All the comments made above about exhibition catalogues apply to this excellent publication. Following chapters on the work of Petrie, the catalogue is divided into sections looking at Sculpture; Archaeology; Sites; Weights and Measures; Daily Life; Writing; Arts and Crafts; Ceramics; Funerary Art; Tools and Weapons; and Faience and Glass. The exhibits show the quality and range of the Petrie collection and most of the items included in this exhibition have never been published before. They range over all periods of Egyptian history and include some unusual objects (such as the wonderful rat trap). Many of the items are domestic pottery, not necessarily of the best quality, but every bit as fascinating as some of the best pieces of sculpture or jewellery also included in the exhibition. Petrie was one of the first Egyptologists to appreciate that it was not just works of art that were important for museums, but the day-to-day possessions of ancient Egyptians. Much has been learnt from the study of these objects, most of which came from Petrie’s own excavations, so we know exactly when, where and how they were found, and they can all be put in a secure and datable archaeological context. This exhibition has brought a new range of ancient Egyptian objects to a wider audience and the catalogue has done the same. Its producers are to be congratulated on a high quality and informative publication that will serve (as will the Bowers Museum catalogue) as a valuable reference book for many years to come. For more information about the exhibition and the Michael C. Carlos Museum, visit the web site at www.carlos.emory.edu. AE receives more books than it is always possible to review in full. Although AE will try to review as many books as possible that we think will be of interest to readers, this may mean that some of the more esoteric books may not be included, nor may some of the more technical or learned volumes. However, it is important that readers should know that books have been published. Brief details will be given in AE from time to time, without formal reviews, comments or recommendations (or otherwise). Published by The British Museum Press. ISBN 0 7141 1956 3. Hardback only. Price £75. Published by The British Museum Press. Hardback only. ISBN 0 7141 1959 8. Price £125. edited by Janine Bourriau and Jacke Phillips. ISBN 1 84217 150 X. Paperback. Price £28. 2. Identity and Occupation: how did individuals define themselves and their work in the Egyptian New Kingdom? Ian Shaw. 3. Canaan in Egypt: archaeological evidence for a social phenomenon. Rachael Thyrza Sparks. 4. The Provenance of Canaanite Amphorae Found at Memphis and Amarna in the New Kingdom: results 2000-2002. Laurence Smith and Ors. 5. The Beginnings of Amphora Production in Egypt. Janine Bourriau. 6. Natural Product Technology in New Kingdom Egypt. Margaret Serpico. 7. Minoan and Mycenaean Technology As Revealed Through Organic Residue Analysis. Holly Martlew. 8. The Production Technology of Aegean Bronze Age Vitreous Materials. Marina Panagiotaki and Ors. 9. Egyptian Sculptor’s Models: functions and fashions in the 18th Dynasty. Sally-Ann Ashton. 10. How to Build a Body Without One: composite statues from Armarna. Jacke Phillips. ISBN 0 3856 0770 9. Hardback. Price £12.99. This is a novel, which, as explained by the Press release, "… brings Alexander’s story vividly to life. With Alexander himself narrating his story, it is a personal and intimate exploration of the life of a passionate and enigmatic warrior and leader. Powerful descriptions of the terror, heat and intensity of the battlefield give us a gripping insight into those brutal and bloody times, and Alexander’s lust for glory". ISBN 0 415 27104 5. Paperback. Price £12.99. ISBN 0 415 27104 5. Hardback. Price £45. This small book covers in 245 pages the broad span of Egyptian History from its origins to the arrival of Islam. The author challenges some of the accepted truths, highlights the enormous gaps in our knowledge and addresses issues such as the race and colour of the ancient Egyptians and Egypt’s relationship with Africa. More importantly perhaps, he tries to explain the place of Egypt in Western European traditions and considers how the West has constructed its own version of ancient Egypt. Chapters are included on dynasties, empires, society, daily life, religion, art, architecture, languages and literature. Robert Morkot is a well-known Egyptologist who lectures at the University of Exeter. Anyone who has heard him lecture will appreciate his approach to the subject and this book appears to be a concise and well written (if sparsely illustrated) history of the subject. If AE readers, students or general readers, are looking for the ideal introduction to the subject, then this could well be it.